The Partygoers | Spreading goodwill through the spontaneous visitation of social gatherings & celebrations since 1997. Hanson and Beck Hansen vs Kriss Kross and Christopher Cross – who wins in a fight? 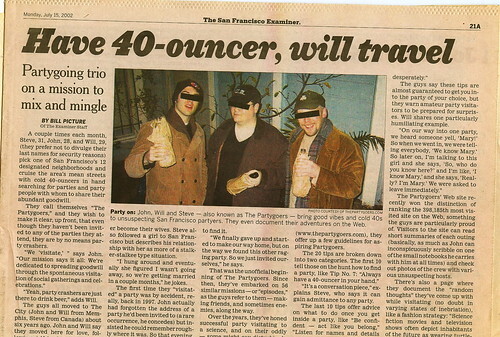 We’re pleased to announce that history is being made today: the Partygoers are reuniting in San Francisco in honor of their 14th anniversary. 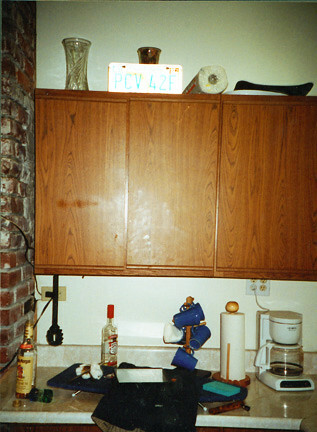 It was a wintery day in late 1997 when the Goers first formed to fulfill their mission of spreading goodwill through the spontaneous visitation of social gatherings and celebrations (i.e., NOT party crashing). Since then, they have attended exactly 114 parties and made each one better through their special blend of old school technique and new school technology. It is believed that the Partygoers will once again be pounding the pavement in their beloved Western Addition neighborhood tonight…if you see them, photo-taking is allowed (if from a respectful distance), but please do not interrupt them as they go about their work. Once again it’s time to Guess What’s in Steve’s Cupboard. Take a look at the picture below, say your answer out loud and click Continue Reading to see if your intuition was correct. Winners will receive a $25 gift certificate good for Partygoers merchandise and memorabilia. Will: We had a tip from an anonymous emailer about a party. Steve: It was out in the Mission. John: We brought our friend Ali along. He’d been out with us before but had never really successfully visitated a party so we needed to do him right. Will: He was there that night we tried and failed to visitate that four person party. Steve: So we go to the Mission, planning to buy 40s once we get there. Will: In any other neighborhood, that’s not a problem. Steve: There were no 40s to be found. We walked for blocks. John: If you’re from the Mission and you come to the W.A., you’ll be able to buy 40s anywhere you want. The 40s are on us. Will: You can find a 40 in the Marina easier than you can in the Mission. Will: It had to be said. John: We’re calling the Mission out. There’s a lot of hype there that needs to be deflated. The house party scene there is dead. Will: We’re just giving some constructive criticism. Maybe if they kept those corner stores open past 9:30 there’d be more parties. John: Anyway, we had to walk forever to buy 40s and when we finally got to the party it was basically over. Steve: It was a dud – a bad tip. John: So we’re stranded in the Mission with Ali, trying to show him what we’re all about, walking all over the place, and we had nothing to show for it. Steve: Finally we decided to head back to the W.A. and call it an evening. John: We had no sooner gotten out of the car back at my house when we heard a raging party around the corner. On a cold, wintry night in late 1997 the Partygoers were born. 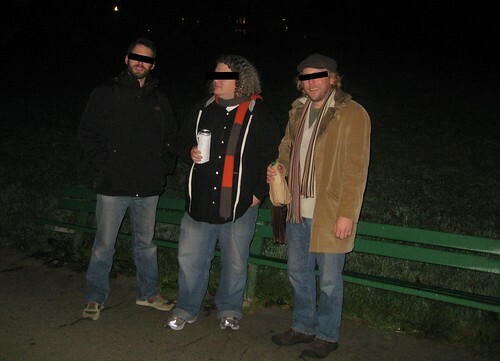 Our three heroes were enjoying a finely brewed malted beverage at a friend’s apartment, when Will, in the heat of a fever, dropped the words “the Partygoers” on the unsuspecting audience. Nothing much was thought of this at the time. Later that evening, Steve and John were on their way to visit another friend when, lo and behold, fate intervened in the form of a raucous party that proved too tempting a treat to resist. Meanwhile, Will had been unfortunately detained by an ailing loved one and was unable to participate in what became the first Partygoers episode. Although technically not invited, Steve and John entered the party with high hopes and a curious eye. Relying only on wit, charm, and their ability to mix the best margaritas in San Francisco, they won over the crowd wholeheartedly. After leaving, they realized they had performed not only a service, but a service that is lacking in their fair City.